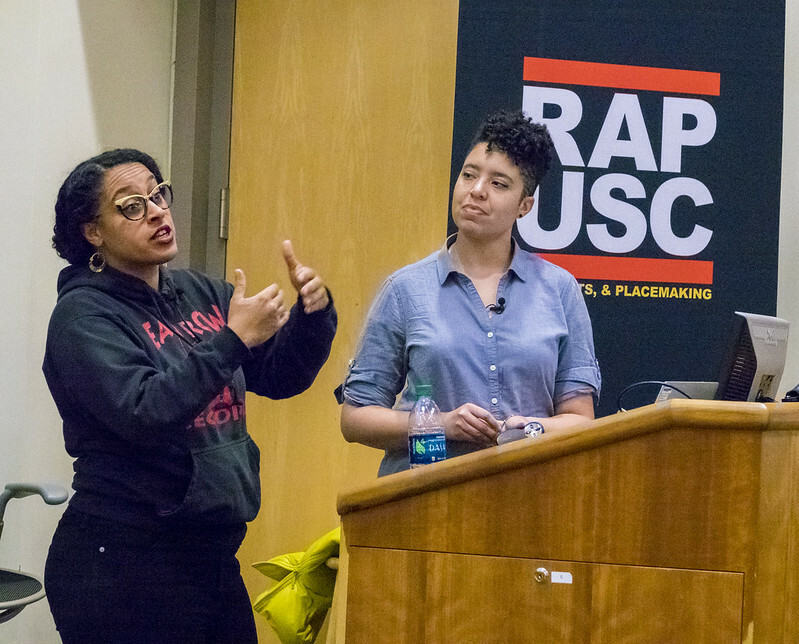 Two college professors from Portland, Ore., spoke about their interdisciplinary work meshing urban planning and art to highlight stories of displacement in historically black neighborhoods, during the USC Price School of Public Policy’s Urban Growth Seminar on Feb. 23. The seminar featured Lisa Bates, a Portland State University associate professor for urban studies and planning, and Sharita Towne, an artist and assistant professor at the Pacific Northwest College of Art. The event was co-sponsored by RAP, a faculty collective on Race, Arts, and Placemaking supported by the USC Provost Research Collaboration Fund; the USC Price Department of Urban Planning and Spatial Analysis (DUPSA); and a generous gift from an anonymous donor. The speakers presented examples of their multi-year project “This is a Black Spatial Imaginary,” which uses official planning documents, historical records, news accounts and interviews with community members to produce art installations, video, print media and public interventions that illustrate the current status of black communities and repeating instances of displacement. 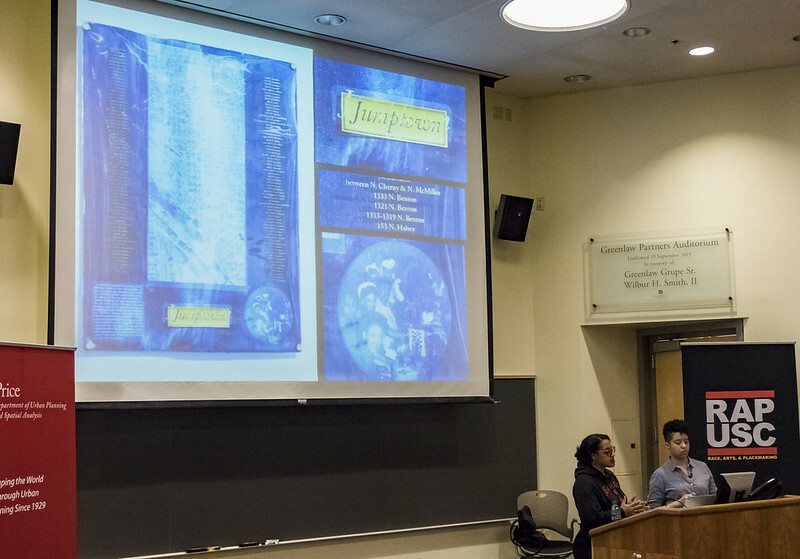 Last year, the Black Spatial Imaginary project led to more than 40 black artists and scholars coming together to showcase work and share ideas. The art installations and public space interventions take place at a time when there are no majority black neighborhoods left in Portland, according to the speakers. “It’s a moment in Portland of really intense gentrification and really an erasure of many of the physical locations where the black community has lived,” Bates said. Beginning in the mid-1950s, infrastructure such as Interstate 5 and the Veterans Memorial Coliseum were built through the heart of black communities. One piece created by Towne and Bates shows a map of the area on which the Coliseum was built in Portland with a plaque reading “Jumptown,” the nickname for the area when it was filled with jazz venues in the ’40s and ’50s, along with a list of addresses for the more than 100 structures that were demolished to build the arena. For an apartment complex being developed by the Portland Community Reinvestment Initiatives at the corner of Martin Luther King Jr. Boulevard and Rosa Parks Way to house 70 families with historic ties to the neighborhood, Towne is creating art based on maps Bates found showing the pathways from where black communities came to Oregon, including a greyhound route from Arkansas. Towne pointed out that her own family ventured westward from Arkansas, then Arizona, and then to Oregon.